Hi *waves* I’m 28 and I’m from Austria. your friend… if you want me to be :-) (okay yeah, that sounded quite cheesy, huh? Supernatural, Psych, The Big Bang Theory, How I Met Your Mother, One Tree Hill, Queer as Folk, Veronica Mars, Buffy The Vampire Slayer, Angel, Firefly, Dollhouse, Dawson’s Creek, Prison Break, 24, Gilmore Girls, Greys Anatomy, Jericho, Scrubs, Friday Night Lights, Lost, Merlin, Leverage, La Femme Nikita (the original), Hart of Dixie, Revenge, The Middle, Alias, Friends... and the list could go on and on… See...? you are dealing with a tv-addict here! Oh and you also need to know that I’m a Whedon fan!! Always was, always will be!! I LOVE Buffy The Vampire Slayer, Angel, Firefly, Dr. Horrible and Dollhouse. For me, this man is the most brilliant creator out there! I’m a music person! I need music in my life – everyday! I think I wouldn’t survive a day without music. And my taste in music varies very much! As you see, it’s pretty much a mix of everything: I listen to Steve Carlson, From Dawn To Fall, Sick Puppies, Bon Jovi, Lady Gaga, Rhianna, Kris Allen, Linkin Park, Goo Goo Dolls, Adam Lambert, Sister Hazel, Robbie Williams, Lifehouse, Shinedown, Snow Patrol, Skillet, Breaking Benjamin, Switchfoot, Jason Manns, Green Day, Nickelback, Evanesence, Simple Plan, Gavin DeGraw, ACDC… etc. etc.! Oh and you should know that I’ve been a Backstreet Boys fan! I grew up with their music and I was a true fan! My obsession calmed down a lot, but I still love their music. 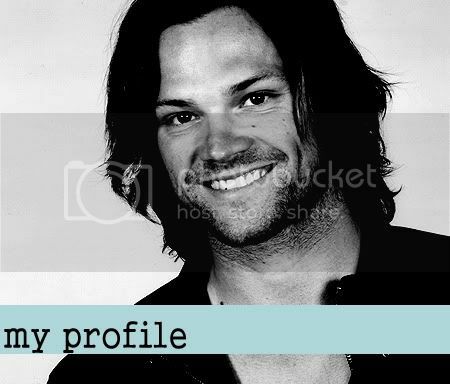 Oh and I am also a maintainer over at j2_rec and owner of jakeabelfans.